I’ve been so busy working on new recipes and photos that I’ve neglected some of my older recipes and this week, I had a taste for carrot cake. I was surprised at how much healthier my baking is now and I thought that if any cake could be made with olive oil, it’s carrot cake. There is so much flavor there with the pineapple, toasted pecans, and cinnamon, I didn’t think you would ever taste the olive oil. So I tried it… and I was right. But that wasn’t the only change I made. I also made it with whole wheat pastry flour so now it’s whole wheat carrot cake and I’ve even simplified the process. 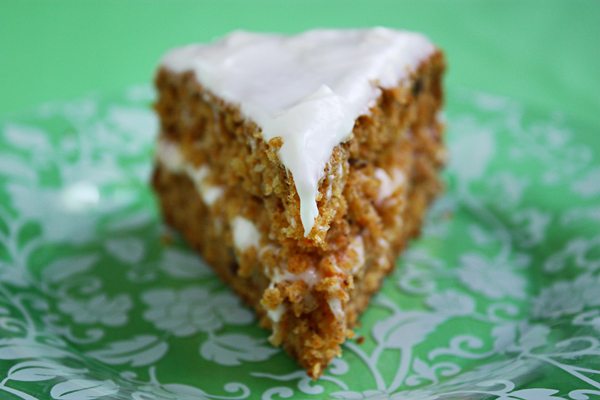 Carrot cake is such a great American creation. I remember the first time I was offered a piece of carrot cake. It was in the early 60s and my landlady in Las Vegas asked me if I wanted to try some carrot cake. Who puts carrots in a cake? You might as well put broccoli in my ice cream! What’s happening here? I must have made a face because she immediately said, “I know it sounds weird, but it’s really good. Just try it.” So I did. Wow! I loved it then and still love it today. If I’m going to have cake, it has to be as healthy as I can make it and whenever I can avoid butter, I do. This cake has no butter, not even in the frosting. It’s a cream cheese frosting made with reduced fat cream cheese. Regarding the flour, the new recipe calls for 1/2 whole wheat pastry flour and half all purpose flour but you can make it with 100% whole wheat pastry flour or even 100% all purpose flour if you like. All variations taste great. One more thing: toast your nuts! There is a world of difference in flavor between raw and toasted nuts. And it’s easy. Put the raw nuts on an ungreased baking sheet at 350 degrees F for 7 – 10 minutes. I toast a whole bunch at a time and keep them in the fridge for all my baking. I prefer pecans in this recipe but walnuts work too… toasted! 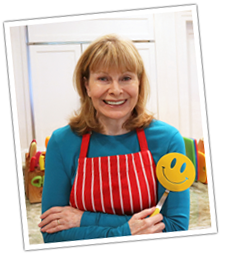 I hope you’ll try my new Whole Wheat Carrot Cake. Click here for the recipe. 2 Comments on "I Reinvented my Carrot Cake"
Looks fantastic, definitely will be trying this for my birthday cake this summer!